C: Well, I started before I knew what fanfic was. I was an undiagnosed dyslexic and I had no love of reading, until I discovered tie in novels, specifically for Start Trek and Quantum Leap. Those books gave me a reason to want and read enough to try. I became quite a quick reader and it has ignited a love of reading that’s stayed with me ever since. I’d been making up stories since I was a young kid but those tie-in novels inspired me to write them down so age 14, I started to handwrite tie-in stories in notebooks. The advent of the PC allowed me to actually write a story that was legible (if badly spelt) but I never showed them to anyone. When I finally got regular access to the internet at home, which I think was aged 20 or 21, I discovered this thing called fanfic, and started to post my stories online. I’ve written in some capacity ever since then and I credit fanfiction with teaching me the skills to become a novelist. I’ve learned far more about language and crafting a story through fanfiction, than school was ever able to teach me. K: From where do you draw inspiration? C: Insomnia. Seriously, I’ve suffered with it since I was a kid and it has only got worse (I now also have a touch of PTSD). So I spend my time until I finally get to sleep, creating and writing stories in my head and generally, a plot or scene will plague me, night after night, until I write it down, then my mind can move on to the next scene. Some of the story ideas that come to me are original, while some revolve around characters who have ignited my imagination. Joss Whedon is a bugger for doing that. I used to write a lot of Buffy and Angel fanfiction and I have noticed that he likes to put seemingly throwaway lines in his work, which spark the imagination. I don’t know if that’s intentional or not, but his work in particular is just a dream for a fanfic writer. C: Because there isn’t enough of the original. When people love something, they want more of it. Simple, really. K: Which is your favourite Loki quote? Why? C: Just one? Damn. No, that’s not my chosen quote. It changes but right now, it would be this. Thor “She wouldn’t want us to fight. That’s the first time we really get to see that Loki misses his brother too, which is why I love it, it humanises him. Such an enigmatic statement. Who did he do it for!?! Their mother? Thor? Himself? TELL ME! I mean, let’s face it, Loki didn’t stick around to make sure the Aether was destroyed, that was left to Thor on Earth, so saving the universe was not his motivation (which could have been a selfish motivation, because no universe = no Loki). Given that saving the universe wasn’t his goal, after failing to destroy the Aether, he could have left Thor to it; his side of the bargain was done, he could have run back to their ship, he could have teleported his arse out of there, he could have used his illusions to appear dead right from the start but he didn’t, he chose to fight the elves. Was his goal to kill the Kursed, who killed Frigga? I believe so. Assuming I’m right though, there are still other ambiguities. After shielding Jane when Thor struck the Aether with lightning, his duty to Thor was done; he didn’t have to push Jane out of the way of the singularity grenade, nearly getting caught by it for his trouble! So why did he save her? Had Thor not saved him, he wouldn’t have been around to kill the Kursed, which would have put a bit of a dampener on avenging his mother. Finally, he didn’t have to save Thor from the Kursed, he could have left him to die, then gone after the Kursed. So why did he rescue Thor? To honour their mother’s memory? Was he trying to prove something to himself; Thor couldn’t kill the Kursed, but Loki did? Or does he not want Thor dead any more? In which case, does he want Thor to keep trying to redeem him, because they certainly can’t have a relationship while Loki is on the side of evil? C: A better understanding of the character(s). Regardless of how great a plot is, it’s the characters that make you love a story. No matter the relationships (sibling, lovers, parental) its character interactions that I love, and those interactions are what I find most interesting to read or write. It’s even more fun to throw some interesting plot points at them and see how the characters handle it, but it’s those interactions that are paramount to me because through them, you uncover more about their motivation. C: I only have one that I’ve published (three that are unfinished, haven’t see the light of day and probably never will) so I’d have to say “Every Villian is a Hero“. After Odin reclaims his throne, Loki is sentenced to 5 years on earth, empathically bonded to a telepathic human named Lisa. It soon becomes clear that SHIELD have been keeping a far closer eye on Lisa than expected, even for someone on the Index of gifted humans. Why did they pick her? Do that know something about her that even she doesn’t? Meanwhile, the Hulk goes on a rampage, seemingly after Stark, then Thor goes missing and Loki isn’t about to lie back and let someone else hurt Thor, that’s his job. 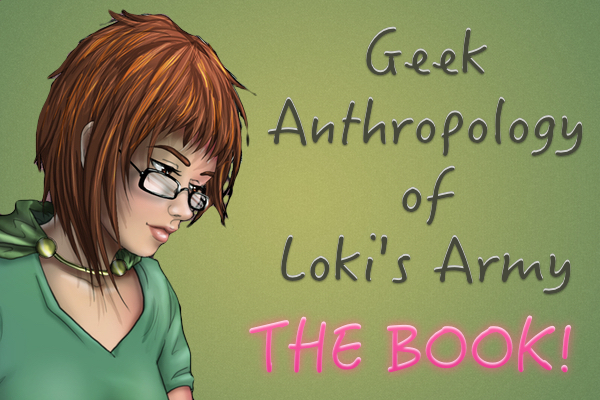 Secrets are revealed, lessons are learned, and there’s lots and lots of lovely Loki snark! C: I’ve pulled a few rubbish April Fools pranks. This year I brought my mother a Tupperware dish of brownies. It was filled with brown letter E’s. Rubbish, I know, but I’m just not mean enough to pull good pranks.